An impressive number of people turned out for this year's Beverly Heritage Days. A wide range of volunteers contributed their time and talents to make the 2012 event one of the largest and most sucessful ever. It was a memorable weekend in Beverly! Below is the pre-event information on Beverly Heritage Days. A Historic Homes and Garden Tour will lead off the featured activities for the upcoming Beverly Heritage Days on July 13, 14 and 15. Live performances of authentic mid-19th century music and a Civil War era fashion show will also highlight the weekend, along with Civil War camps and skirmish, living history and demonstrations. The houses will be open for touring from 10 a.m. to 4 p.m. Saturday, July 14. Tickets are $15 and may be purchased at the Beverly Heritage Center. Houses on the tour include the Peter Buckey House and Hotel which was built as a log home before 1791, when Peter Buckey purchased it as a hotel and tavern. It was managed by George Buckey during the Civil War. Later it was expanded by the Pence family and used as a hotel until well after 1900. Now owned by Deborah Farrell, the home has been largely restored maintaining many of its historic features. The Jonathan Arnold House was built in the 1820's and bought by Jonathan Arnold in 1845. Jonathan's wife was Laura Jackson Arnold, the sister of Confederate General Thomas "Stonewall" Jackson. Stonewall was known to have visited the house many times. During the war, Union soldiers were boarded at the Arnold house. Tours of the downstairs will be led by homeowner Joan Pitts, including her newly rehabilitated loom room. The log rear section of the Rowan House dates from the early days of the town. The two story front I- house addition was added after the Civil War. William Rowan, who operated a hat factory in Beverly, bought the house in 1838. His son Adam took the family south during the Civil War. Master gardener Barbara Heasley will share her extensive heritage-inspired gardens behind the Rowan House for the tour. The Birkett/Cresap House on south Main will be shared by homeowner Mary Kay Bidlack. An early log house on this site, run by Issac Baker, Sr. as "The Rising Sun" hotel, was destroyed during the Civil War. Rev. John Birkett built the existing I-house after the war. In 1871, he sold it to Charles Cresap, a Beverly lawyer, who served in the state legislature in 1881. The brick and stone Randolph County Jail on Walnut Street was built in 1841 to replace the 1813 jail. The jailer’s residence was in the front of the building. It was used until the Elkins jail was built in 1913. Plans are underway to rehabilitate this building for a commercial use. Featured music during the event will start with a concert by the Blue and Gray Community Choir on July 13th at 7:30 p.m. in the historic Beverly Presbyterian Church. Founded in 1989 to compliment the annual Blue and Gray Reunion in Philippi, WV, site of the first land battle of the Civil War, the choir of forty-five volunteer singers under the direction of Dr. Judson Bracey and accompanied by Michele Moore will perform a variety of sacred, patriotic and folk songs from the mid-19th century. Songs associated with the war, such as “Dixie” and “Marching Through Georgia” will be featured along with such entertaining American folks songs as “She’ll Be Coming Round the Mountain” and “Cindy” and sacred songs that reflect the religious fervor of the period. The choir has achieved an excellent reputation for its choral performances of authentic Civil War era music. Prior to the concert, a home cooked dinner by the Presbyterian Church Ladies will be available starting at 6 p.m. Dinner tickets are $10 in advance or $12 at the door. Saturday’s musical highlights include a program by Mountain Winds at 11 a.m. in the 1808 Randolph County Court House. Their performance will include long forgotten 19th century dances and parlor music. Working from several privately bound volumes of 19th century piano sheet music that he has purchased through the years, Richard Evans arranged the music for wind trio. “The selections include a delightful assortment of polkas, schottishes, waltzes, galops and marches that will charm the listener,” said Evans. Besides the dances, there will be rousing war songs and sentimental ballads in instrumental guise. At 1 pm Saturday, members of the Rich Mountain String Band will feature a mix of traditional fiddle tunes, minstrel songs, and 19th century popular music that continue to engage listeners and dancers 150 years after their first performance. The Rich Mountain String Band will also conduct a Civil War Ball at 8:00 pm under the event tent beside the Beverly Heritage Center. Caller Phyllis Baxter will teach all dances and invites beginners and seasoned dancers to join in the dancing. Inside the courthouse Pamela Dodds will be heard during the afternoon performing on a 19th century Melodeon, a type of pump organ, that her husband Art restored and placed on loan to the Beverly Heritage Center. She will accompany flutist Richard Evans playing songs and dance melodies from “The Union Collection of Popular Duets” published in 1860 by Boston music publisher Oliver Ditson. Later in the day she will accompany Gary and Millie Goetze as they sing hymn tunes from various early 19th century hymnals. Other musicians will take turns throughout the day playing a variety of types of traditional music. Beverly Heritage Days is a biennial event that interprets traditional life in the former county seat of Randolph County (West) Virginia. Additional activities will include living history scenarios and demonstrations with crafts persons, military soldiers, musicians and town’s people. Vintage automobiles are expected to visit the Town Square on Saturday while a Civil War era seamstress will have material, patterns and finished 19th century clothing available for purchase in the IOOF Building. A skirmish Raid on Beverly will take place at 4 pm Saturday. Period children’s games and activities will be offered along with a variety of food choices including BBQ and a pie sale. 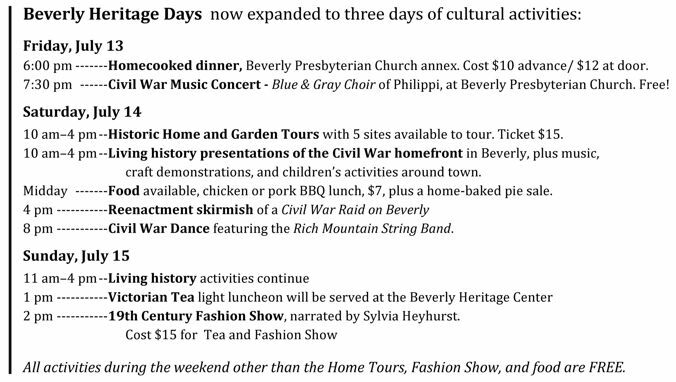 All activities at Beverly Heritage Days except Home Tours, Fashion Show and food are free. The event is sponsored by the Beverly Heritage Center with partial funding from the West Virginia Sesquicentennial of the American Civil War Commission. For more information call 304-637-7424. What was it like to live in a western Virginia town during the Civil War? How would you feel to have soldiers in the streets and in your homes? To need a pass to travel or leave town? How did the young soldiers feel, far from home and family? Beverly will explore some of these experiences during Beverly Heritage Days, July 13, 14, and 15. Living history scenarios relating to Beverly during the Civil War will be featured especially Saturday from 10 a.m. to 4 p.m. 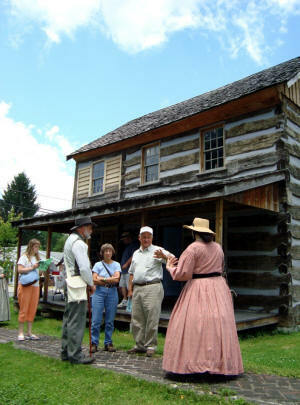 Visitors can see Civil War camps, soldier and civilian demonstrations, and first person characters during that time. Saturday at 4 p.m., the skirmish of a “Raid on Beverly” will take place along Walnut Street behind the Beverly Heritage Center. Historically, Beverly was occupied for most of the war by Union troops. Confederates raided several times, twice successfully, but were not able to hold the town for long. Expected living history scenarios include a cemetery with authentic gravestones of soldiers and civilians who died during the war, behind the Bosworth store building. Union pickets in town will be stopping travelers requiring a travel pass. Visiting politicians such as Gov. 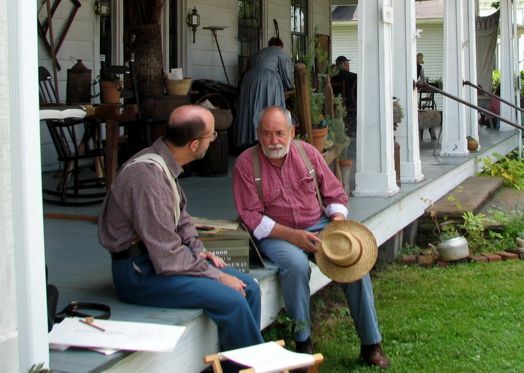 Francis Pierpont, portrayed by Art Dodds and Sen. John Carlisle, portrayed by Gary Goetze, may debate issues related to West Virginia statehood. Beverly printer Karl Mulac will appear as Jefferson L. Cherry, printer and telegrapher with Gen. McClellan’s army. He will be printing on an authentic reproduction Civil War era field printing office. Other demonstrations will include blacksmithing and woodworking. Weaving, spinning, and basketmaking demonstrations will be offered by members of the Mountain Weavers Guild. A variety of Beverly’s historic homes and gardens may be toured Saturday from 10 a.m. to 4 p.m. Tickets for the home tour are $15, and may be purchased at the Beverly Heritage Center. Children’s activities will include the opportunity to play 19th century games. Young people can also do hands-on block printing of their own, and take their results home. Music during the weekend will start with the Blue and Gray Choir concert, Friday, July 13 at 7:30 p.m., at the Beverly Presbyterian Church. During the day Saturday, a variety of musicians will be playing both inside the Beverly Heritage Center, and outside on the grounds. Saturday evening at 8:00 p.m., visitors can dance Civil War style to the playing and calling of the Rich Mountain String Band. Food available will include a homecooked dinner by the Presbyterian Church ladies Friday evening at 6:00 p.m. (tickets $12 at the door). Tygarts Valley Lions Club members will cook BBQ chicken or pork lunch Saturday mid-day for $7, and a pie sale will be held on the porch of the Goff house on Saturday. Sunday, July 15, the weekend activities will be capped off with a Victorian Tea and Fashion Show, ticket cost $15. The tea featuring finger sandwiches and baked goods will be served at 1 p.m., followed at 2 p.m. by the Fashion Show of Civil War era attire, narrated by Sylvia Hayhurst. All events during the weekend are free except for the Home Tours, Fashion Show, and food. Civil War demonstrations are made possible by funding by the West Virginia Sesquicentennial Commission of the American Civil War, and through the cooperation of the West Virginia Reenactors Association. Beverly Heritage Days is sponsored by Historic Beverly Preservation, Rich Mountain Battlefield Foundation and the Beverly Heritage Center. Activities will take place at the Beverly Heritage Center and throughout the town of Beverly. Beverly shops and attractions will also be open and participating through the weekend. Beverly is located 6 miles south of Elkins, WV on US Rt 219. For more information call 304-637-7424.